(Nanowerk News) Today's batteries cannot take in all of a wind farm's energy on a blustery night and hold it until it is needed the next day. A promising option is to create a higher capacity battery by replacing the negative electrode in conventional batteries with one made of lithium metal. The problem? Dendrites-deposits that form on electrode surfaces during the charging process-cause the batteries to short circuit, leading to serious safety hazards. Recently, scientists discovered how to prevent dendrite formation. For the first time, a team including experts at DOE's Pacific Northwest National Laboratory grew protective films around the anodes that prevented dendrites from forming ("Dendrite-Free Lithium Deposition with Self-Aligned Nanorod Structure"). Large-scale use of high-energy rechargeable lithium metal batteries is limited by harmful deposits called lithium dendrites. A recent JCESR study evaluated the effect of an electrolyte additive that suppresses lithium dendrite formation. Transforming our nation's energy economy means finding better ways to store energy. The findings from this study, done through DOE's Joint Center for Energy Storage Research (JCESR), could help scientists design a safe and stable metallic lithium anode and ultimately pave the way for the practical use of high-energy-density battery systems for electric vehicles and storing renewable energy. Researchers from Pacific Northwest National Laboratory, plus Harbin Institute of Technology, Wuhan University, Tianjin Institute of Power Sources, and the US Army Research Laboratory evaluated the effectiveness of an electrolyte additive called cesium hexafluorophosphate (CsPF6) to improve the performance of the battery and protect the negative electrode or anode. The researchers used high-resolution scanning electron microscopy with energy dispersive x-ray analysis to study microstructure and elemental composition, and high-resolution x-ray photoelectron spectroscopy for more detailed chemical characterization. Both instruments are at EMSL, a DOE national scientific user facility. The CsPF6 additive promoted dendrite-free growth of films made of tightly packed lithium nanorods, which resemble a fistful of dry spaghetti noodles. 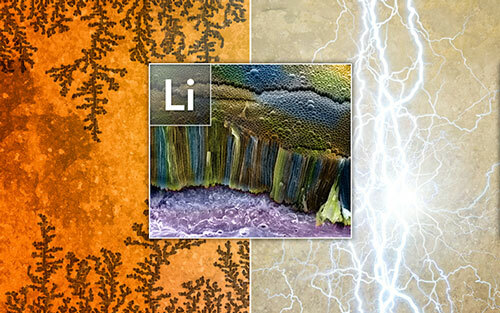 The electrolyte additive also promoted the creation of a lithium-rich solid electrolyte interface layer. This complex layer quickly forms from the decomposition products in the battery's electrolyte, the substance in batteries that acts as a medium to conduct lithium ions between electrodes. The combined effect of the Cs+ additive and the SEI layer contributed to the lithium ions being smoothly deposited on the surface, free of dendrites, during charging. Moreover, the lithium films remained free of dendrites after repeated charging and use, or deposition/stripping cycles. Taken together, the findings show CsPF6 promotes ordered and smooth growth of lithium metal films, protects the anode, and improves battery performance. The researchers are continuing to understand the factors that affect the formation and evolution of the SEI layer and other components of the battery to stabilize long-term performance of lithium metal and other metal anodes.